Instead of a traditional candy bar, why not choose to have something a bit more creative and off-the-beaten-path? A waffle bar surely will pleasantly surprise your guests and they will remember your wedding forever! Who can resist the soft Belgian waffle with a paradise of toppings of nuts, chocolate sauce, Nutella, ice cream, maple syrup, fresh fruit pieces and whipped cream? 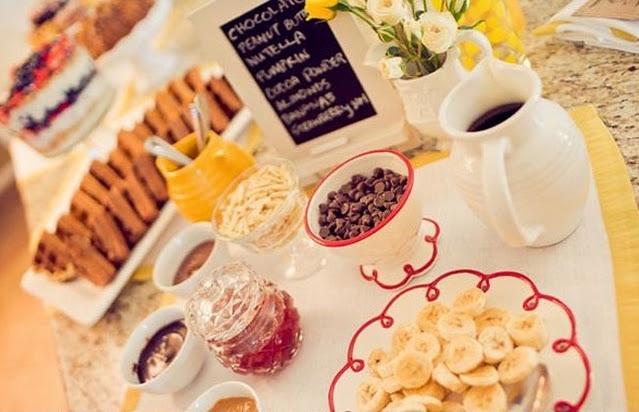 Setting up a waffle bar is also relatively easy and inexpensive. If your wedding is small and intimate, you can even make all the waffles yourself with a waffle maker. Making waffles is easy, I have a tried recipe from Betty Crocker that hasn’t failed me once. You could try making some waffles to test before and decide which recipe you can use for your wedding. Another fun idea: you can also pre-mix jugs of waffle batter and set up a “Do it yourself” corner with waffle irons at your wedding so that guests can make their own waffle. You can prepare different types of waffle batters (regular and chocolate waffles for example) so that people can choose their own favorite.